Fascinating perspective of a symmetrical. yet crumbling. 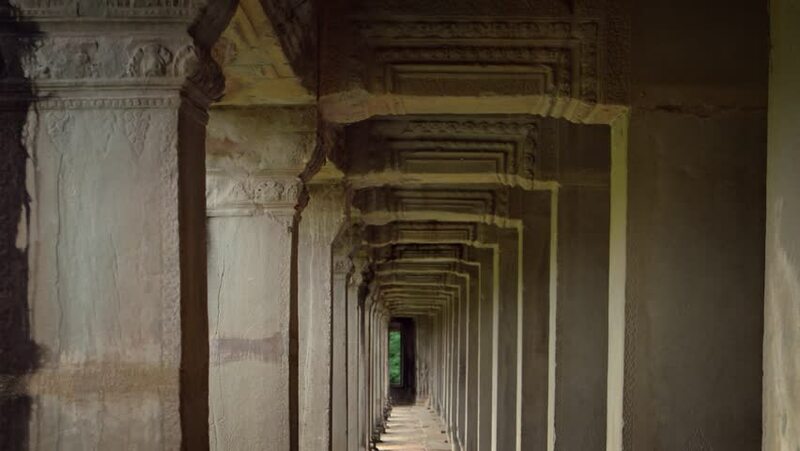 outdoor corridor at the ancient ruins of Angkor Wat Temple in Cambodia. sd00:13Palmyra, Syria - 2005 - Tilt up from the main entrance, or regia of the Roman Theatre in Palmyra, built into a broad curved niche to the sky. Corinthian columns decorate the stage area. sd00:07ASSISI, ITALY - CIRCA OCTOBER 1998: High angle view of Santa Maria Della Angeli interior and floors. 4k00:11Nepali architecture in Durbar Square at Bhaktapur, Nepal. Shot on Red Scarlet. hd00:09PETRA, JORDAN CIRCA 2016 - Low angle view of the facade of the Treasury building in the ancient Nabatean ruins of Petra, Jordan. sd00:19CU large wooden door at entrance to Caerlaverock Castle, camera zooms out and tilts up to top of castle in Dumfries, Scotland.